A synapse is a gap that is present between two neurons. Action potentials are communicated across this synapse by synaptic transmission (also known as neurotransmission). Neurotransmission requires the release of a readily available neurotransmitter by exocytosis, binding at post-synaptic receptors, an appropriate response by the post-synaptic cell and removal or deactivation of the neurotransmitter. In this article we shall look at the stages of synaptic transmission and clinical conditions that arise in its pathology. Fig 1 – Diagram showing the general process of synaptic transmission. This is the first step of synaptic transmission. Some neurotransmitters (eg acetylcholine, ACh) are synthesised in the axon while others (eg neuropeptides) are made in the cell body. Acetylcholine– synthesised within the axon. Precursors (choline, acetate) taken into the cell by membrane channels or created as byproducts of other processes. Precursors used to synthesise neurotransmitters via enzymes (choline acetyltransferase) transported from the cell body where it is made to the axon terminal. Endogenous opioids – a neuropeptide (larger neurotransmitter) made within the cell body to allow formation of peptide bonds. Made as any secretory protein via transcription in the nucleus and translation in the endoplasmic reticulum before being transported to the synaptic terminal ready for exocytosis. Once synthesised, neurotransmitters are stored in vesicles within the synaptic terminal until an action potential arrives, causing their release. Action potentials arriving at the synaptic terminal leads to the opening of voltage gated calcium channels. This allows an influx of calcium in the terminal resulting in the migration of neurotransmitter storage vesicles to the pre-synaptic membrane. 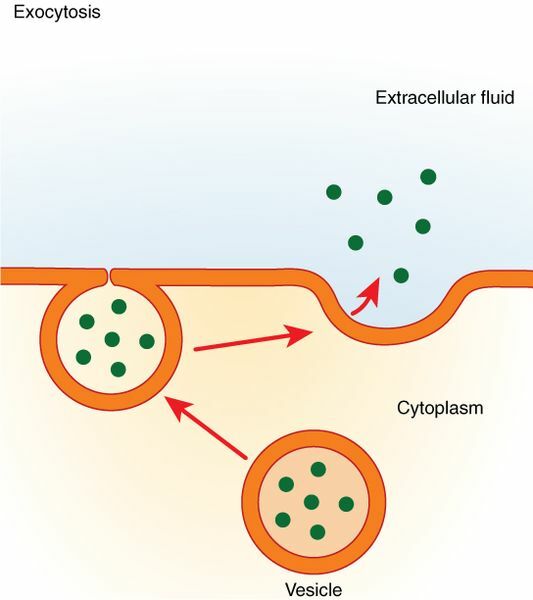 These vesicles fuse with the cell membrane (exocytosis) under the influence of calcium causing neurotransmitter release into the synaptic cleft. Fig 2 – Diagram showing exocytosis, the process by which neurotransmitters are released into the synaptic cleft. 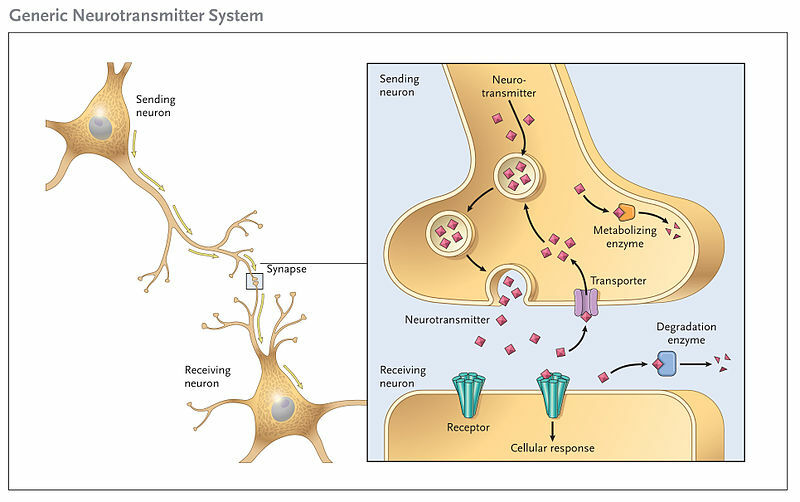 Neurotransmitter in the synaptic cleft diffuses across the gap to the post-synaptic membrane. Here, they can bind to two types of post-synaptic receptors. This can cause either depolarisation to promote or hyperpolarisation to inhibit action potential generation in the post-synaptic neurone. Acetylcholinesterase inhibitors are a class of drug that inhibit the activity of acetylcholinesterase within the synaptic cleft. This increases cholinergic transmission as ACh is present within the synaptic cleft for a longer period of time. As cholinergic transmission is widespread throughout the body these drugs can cause many side effects such as bradycardia, hypotension, diarrhoea, excessive salivation, muscle spasm.